The skill of making this special type of tea spread from the North of Fujian province southward to the Anxi and Guangdong province’s Chaozhou area (Phoenix Mountain) before crossing the strait to Taiwan around 1810. These areas continue to be the bases for the four major categories of wulong tea: Wu Yi Mountain Rock Wulong, Anxi Wulong, Guangdong Dan Cong Wulong and Taiwan Wulong. If you’ve read up on the histories of black tea and white tea, you’re likely to be well acquainted with China’s Fujian province. This Southeastern coastal province, historically rich with ethnic diversity, has been a watershed of tea culture innovations for over a thousand years. In light of this history it may come as no surprise that Fujian is responsible for creating and perfecting the first wulong teas. With biological diversity atop mineral rich soil from weathered rock, Fujian’s Wu Yi Shan has long been recognized as a very special place that is well suited to grow very special tea. Even prior to when it bore the wulong style, Fujian’s northern Wu Yi Shan region had already seen a golden age of tea production starting in the Tang Dynasty (618-907 AD) and peaking in Song (960-1279). The compressed cakes of tea made in Wu Yi Shan during the late song dynasty were ornate treasures of their day, produced with a skilled method that has yet to be recovered from history. In 1392, the newly established Ming Dynasty (1368-1644) instated a sudden prohibition on Wu Yi Shan’s most famous product: compressed cakes of tea. An attempt to break the long standing corruption and excess the tea trade perpetuated, the Ming Dynasty’s ban on compressed tea inadvertently imposed a dark age on Fujian tea making. With their factories raided and equipment confiscated, tea production was effectively shut down for 150 years. Ironically, from this dark age, all of the region’s most famous innovations were born. In the tumult of adjusting tea producing infrastructure to produce loose leaf tea, Fujian’s tea makers (likely Buddhist monks operating in their temples) invented charcoal roasting techniques to dry their tea. The slow charcoal roasting coupled with the accidental oxidization of their tea defined the characteristic flavor of Wu Yi Shan’s wulongs that continue to be produced today. Exactly when the process began no one knows for sure, though the the first mention of this tea comes from a poem written by a monk living in Wu Yi Shan during the late Ming and early Qing Dynasties. He refers to this tea as “Yan Cha” (lit. “Rock Tea”) a name still commonly associated with the Wu Yi Wulong style today. Wu Yi’s technique for making partially oxidized and charcoal dried tea spread south into the now famous producing areas of Anxi and Chaozhou and across the strait to Taiwan. Over time this skill was embellished into distinct regional styles defined by the local tea bush cultivars, local soil quality, and local culinary preferences. Initially though, all of this new style of tea resembled the dark, long and slightly twisted appearance of Wu Yi wulong tea today. The name “Oolong” or “Wu Long” meaning “Black Dragon”, is likely a reference to the tea leaves’ unique resemblance to the curling body of mythical Chinese dragons. Chinese wulong (oolong) is considered the most complicated tea produced and requires great skill and experience to craft their enormous range of flavors, fragrances and liquor colors. One tea master, Lin Zhi, in comparing tea to painting said that wulongs were like oil paintings, while black tea was like water colors, and green tea like Chinese ink paintings. Wulong being the thickest and most complex medium of the group. In more concrete terms, Chinese wulong tea relates to green and black tea as sort compromise in processing. Like all other types of tea, the flavor of wulong is greatly influenced by how little or how much the leaves have oxidized. Leaves in wulong tea can range in oxidation from 15%-75%; a split between green tea’s near lack of oxidation and black tea’s near total oxidation. Even before the leaves reach the defining step of oxidation, the process of making wulong tea contrasts with other styles. To begin, wulong tea’s harvest time is comparably later than green, white or yellow tea. Even “Spring Wulong” tea is not picked until April or even May. The standard for picking is three or four fresh, open leaves. Buds are very rare, but occasionally show up in Taiwanese made wulong. After picking, a year’s crop of wulong tea may take about month to process before it goes to market in July. The later picking time is necessary so producers can score bigger leaves that are durable enough for processing and also rich in aromatic oils. These aromatic oils are the flavor precursors brought out by carefully controlled oxidation and multiple stages of moisture removal. Processing is different in the four different regions of wulong manufacture but the basic process can be described as follows. After picking, fresh tea leaves are withered in the sun for a few hours. Once the leaves lose enough moisture to become pliable, they are taken indoors and placed in bamboo trays and agitated to start their slow oxidation process. As tea oxidizes, it continues to wither in the controlled temperature of the room. After the tea is suitably oxidized, it is exposed to very high heat- ceasing all enzymatic oxidation. This is usually done by quickly sending the tea though a long tumbler of hot air which replicates pan frying. After this step, the tea may be shaped. This is when Anxi and Taiwanese wulong leaves are rolled into their distinctive ball form. The finished tea is then roasted over charcoal to further remove moisture until it becomes a suitably dry and stable product. It’s important to note that when processing tea, the tea masters don’t think in terms of drying; they think in terms of removing moisture. That may sound like the same thing, but in Chinese thinking it is very different. The tea is never completely dried, and at different stages of production, when the percentage of moisture content is at a certain level, different processes will be used. The tea master determines a tea’s moisture level by look, touch, and especially by smell. The smell of the leaves is critical, and tea masters do everything they can to avoid catching a cold during the tea making season. There are many variations in the techniques to making wulongs and describing all of them here is beyond the scope of this discussion, but in terms of general characteristics, the Anxi and Taiwan teas are most closely related, and the Wu Yi and Dan Cong wulongs are at least somewhat similar, with the Dan Cong tea making techniques coming from Wu Yi Shan. Anxi and Taiwan teas are rolled into balls, are lightly oxidized and tend to be lighter tasting with an aftertaste that is sometimes stronger then the immediate taste. Dan Cong and Wu Yi teas are commonly more oxidized, and their leaves are rolled lengthwise. The immediate taste can be quite strong, with a sweeter, lighter aftertaste. Of course there are many examples of exceptions to these generalities, but it is safe to say that all wulongs are very complicated and sophisticated teas, with a large spectrum of tastes, aftertastes and smells. Different wulongs are prepared to accentuate the natural character of the tea bush and their growing area. Perhaps the most the most complex meeting of a master’s skill and the terroir is still the original wulong tea from Wu Yi Mountain. Shapes and flavors of regional wulong are far from consistent. Shifting market preferences may quite literally reshape an wulong tea. As recently as 1995, Anxi wulong was not curled as we know it today, but looked much more like the dark, open leaf Rock Wulong from Wu Yi Shan. In the first decade of this century, greener, lightly oxidized tea have come into popularity. What we are examining is the the ascendancy of newly developed Taiwanese manufacturing techniques and a market preference for tea that delivers highly floral aromatics. Even more recently, aged wulong tea has become popular. Perhaps this can be explained as a backlash against the highly aromatic and lightly oxidized wulongs, or perhaps because a surge of interest in aging teas caused by the puer market boom. Regardless of why, aging wulong tea is not a long standing traditional practice of experts but is rather a practice of rural Chinese who have kept aged wulong tea (not to mention white tea and black tea as well) for its medicinal cooling quality. Recently, wulongs have become interesting to the West because of current research being done with obesity and weight loss, but wulong teas with heavier oxidation have been famous for hundreds of years for aiding digestion, curing headaches, and cleansing the system from excessive use of smoke and alcohol. Though promising research has been published, the weight loss claims surrounding wulong tea have yet to be substantiated by a large body of western medical research. Beware of unscrupulous merchants trumpeting claims of weight loss to mask poor quality tea. As with all tea, we suggest the health benefits are just icing on the cake; the experience of drinking these teas are what it’s all about. Still, physiological comforts to drinking wulong can be quite blatant if one takes some tea (especially Dan Cong!) after a heavy meal. Soothing to the stomach, wulong tea is a great counter balance to rich or greasy food. A famous culinary grease cutter in its own right, Rock Wulong tea also offers nutrients from the mineral rich soil of Wu Yi Shan, which are popularly believed to benefit joint health, to relieve muscle aches and are considerably popular in Japan as an aid to liver health. On the other end of wulong’s spectrum of processing, the lightly oxidized teas Anxi and Taiwanese wulong is viewed by traditional Chinese medicine as beneficial to the respiratory system. 1. The best wulong tea never becomes bitter, no matter how long it is infused. 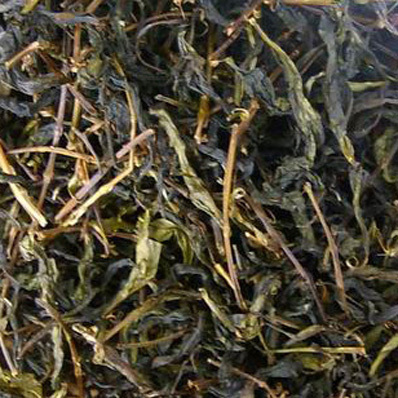 It is true that some good Dan Cong wulong can have some bitterness that is sought after, especially by locals, but the better Dan Cong wulongs are sweeter and more smooth. A rich flavor through multiple infusions and a long aftertaste should be expected from all wulong teas. 2. With Anxi, Taiwan, Dan Cong, most leaves should not be damaged and should look reasonably whole once they are infused and unfold. Because Rock Wulong undergoes multiple stages of roasting, its leaves can be expected to be brittle and usually less than whole. 3. After making the tea, the leaves should be tender, pliable and look fresh. The leaves should not be chewy, old and thick – this is evidence of a very late picking.